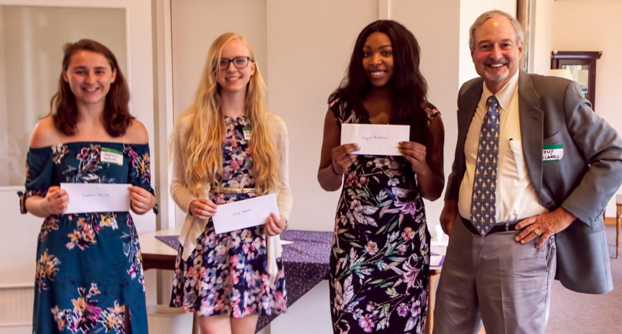 From left: Stephanie Rasinski, Hayley Marshall and Kanijah Brickhouse received 2018 ALL Betty Ross STEMM scholarship awards from ALL Scholarship Chairman, Tony Picardi. To commemorate the 12th year of its existence the Academy for Lifetime Learning (ALL) is offering $1,000 scholarships to help graduating students on the Eastern Shore of Virginia to continue their educations at a community college or university. Since our nation needs to build its skilled technical workforce, this scholarship requires that the student’s academic goal be in the discipline of Science, Technology, Engineering, Mathematics or Medicine (STEMM). This scholarship is to be used to defray college expenses. In honor of the founder of The Academy for Lifetime Learning who passed away in 2014, this scholarship has been named the Betty Ross Academy for Lifetime Learning Scholarship. The Academy for Lifetime Learning of the Eastern Shore of Virginia is an all-volunteer, not-for-profit organization. Members share a common interest in continuing learning experiences and intellectual stimulation. Requirements for the scholarship are found here. The online application form is found here. Application must be completed and submitted no later than May 15, 2019.